I completed my BA, MA, and PhD at Exeter before moving north of the border for six years as Teaching Fellow in New Testament Studies at the University of St Andrews (2000-2003) and then Lecturer in New Testament Studies at the University of Glasgow (2003-2006). I returned to Exeter as Lecturer in New Testament Studies in 2006, and became a Senior Lecturer in New Testament Studies in 2011. In 2018 I was promoted to Associate Professor in New Testament Studies. My major research interests are anthropological approaches to, and cultural and contextual implications of, the interpretation of biblical texts. Latterly this has been particularly focussed on embodiment and disability. My PhD thesis was published as An Ethnography of the Gospel of Matthew (Tubingen: Mohr Siebeck, 2002). My second book, explicitly brought cultural anthropology into dialogue with biblical texts. See Reading with Anthropology: Exhibiting Aspects of New Testament Religion, Paternoster, 2005. See also my co-edited volume with M. Aguilar, Anthropology and Biblical Studies: Avenues of Approach, Deo 2004. After my return to Exeter, I undertook a three year research project (2006-2009), sponsored by the South West Ministry Training Course (http://www.swmtc.org.uk) entitled ‘Texts of Land, Sea and Hope’. This project initiated a number of community readings of the bible across the region in a wide diversity of contexts (rural; urban; coastal) and amongst a variety of people (intentional communities; artists, D/deaf groups etc.) Results of this project were published in my third monograph entitled: The Word in Place: Reading the New Testament in Contemporary Contexts (SPCK 2009). In 2009-2013 I undertook a British Academy funded project exploring sensory-disability in New Testament texts and interpretation. This culminated in my fourth monograph: Sense and Stigma in the Gospels: Depictions of Sensory-Disabled Characters (Oxford: Oxford University Press, 2013) . My fifth monograph entitled, Bible and Bedlam: 'Madness' ,Sanism, and New Testament Interpretation (T&T Clark/Bloomsbury 2018) was released in August 2018. I am Director of Education for Theology and Religion and the Liberal Arts Programmes at Exeter. I am also the editor of the Journal for the Study of the New Testament, one of the leading peer-reviewed academic journals in New Testament Studies. My research expertise encompasses three inter-related areas: (a) Disability Studies and Biblical Texts; (b) Contextual Readings of New Testament Texts; (c) Social-scientific Approaches to New Testament Interpretation (especially anthropological approaches). I have written five monographs, co-edited a collection of essays and produced over twenty peer-reviewed articles and essays in these areas. My most recent project/monograph entitled, Bible and Bedlam: Madness in New Testament Interpretation (currently in press with T&T Clark/Bloomsbury, out in 2018) attempts to unveil the normative, rational and ‘neuro-typical’ assumptions surrounding the discipline of biblical studies. My 2013 monograph, Sense and Stigma in the Gospels: Depictions of Sensory-Disabled Characters (Oxford University Press, 2013) exposed the sensory disabilities of biblical studies as a largely sight-centric endeavour. My 2009 monograph, The Word in Place: Reading the New Testament in Contemporary Contexts (SPCK) documented the results of a three year project (in conjunction with the South West Ministry Training Course) which initiated community readings of biblical texts within a diversity of settings (urban, rural, coastal areas etc.) across Devon and Cornwall. Published biblical ‘readings from below’ by ‘ordinary’/’untrained’ readers have hitherto largely been dominated by work in majority-world settings. The prism of the West often de-contextualises the ‘ordinary’ bible reader in Britain; this book is an important voice in showing how industrialised Western readings also can be inflected by deep place concerns. Reading with Anthropology: Exhibiting Aspects of New Testament Religion (Paternoster, 2005) and An Ethnography of the Gospel of Matthew: A Critical Assessment of the Use of the Honour and Shame Model in New Testament Studies (Mohr Siebeck, 2003) both employed social-scientific methodologies and posed important challenges to the modes in which biblical scholarship hitherto had utilised these fields. 2012-2016 Helen John, ‘African Traditional Religion and Christianity: Contextual Bible Studies in Namibia’ (f/t) (HASS Funded) [completed, passed with no corrections, 2016]. Student employed to convene and teach core module for Liberal Arts programme at Exeter (2016-2017). 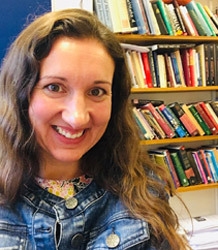 2010-2016 Cherryl Hunt, 'Promoting Biblical Engagement Among Ordinary Christians in English Churches: Reflections on the Pathfinder Project' (p/t) (Bible Society Funded) [completed, passed with no corrections, 2016]. I have collaborated in research and impact wth Signs of God, The BSL Deaf Bible Project, Bridge Collective and Hearing Voices Network and The Bible Society. 2015 The Bible and Disability, Theology, Quest and Questions Series, Tiverton. 2008 Main speaker (with Bishop of Exeter) at 4 Diocesan conferences (Exeter, Plymouth, Barnstaple, Torbay) with over 1000 people at each event. "Texts of Land, Sea and Hope", with Mike Higton, Christopher Southgate and David Horrell. £67,656, SWMTC, 2006-2009. "The Bible in Non-Literate Contexts". Funded by Bible Society, 2012. I have served as Director of Education for Theology and Religion and Liberal Arts since 2013, and have instituted a number of initiatives within the department specifically aligned to the University Education Strategy. I also wrote the new core module, 'Being Human' for the Liberal Arts programme and have overseen quality control and programme review of Liberal Arts. I have also led the design, writing and accreditation of a new degree programme for Theology and Religion 2015-2016 u/g entry, in line with revised subject benchmark statements for the discipline published in 2014. I have designed and implemented a variety of different learning and assessment methods in my Level 2 & 3 option modules including evaluation of u/g research posters by postgraduate researchers, response-ware classroom activities and creative writing portfolios. Also in-service/field visit reflection reports on class visits to Sense (https://www.sense.org.uk/content/providence-court-and-caf%C3%A9-55) and the Bridge Collective (http://www.bridgecollective.org.uk/). My commitment and innovative teaching practice has been corroborated by my success at the Guild Teaching awards. In 2017 I was runner up in the ‘Most Supportive Staff Member’ category, in 2013 I was shortlisted in the ‘Research Inspired Teaching’ category and in 2012 I was runner up in the ‘Best Lecturer’ category. 2017 Designed, wrote and accredited new core level 1 module and revised programme structure of Liberal Arts degree programme. 2013-2014 Designed, wrote and accredited new Degree Programme in Theology and Religion for 2015-16 entry.